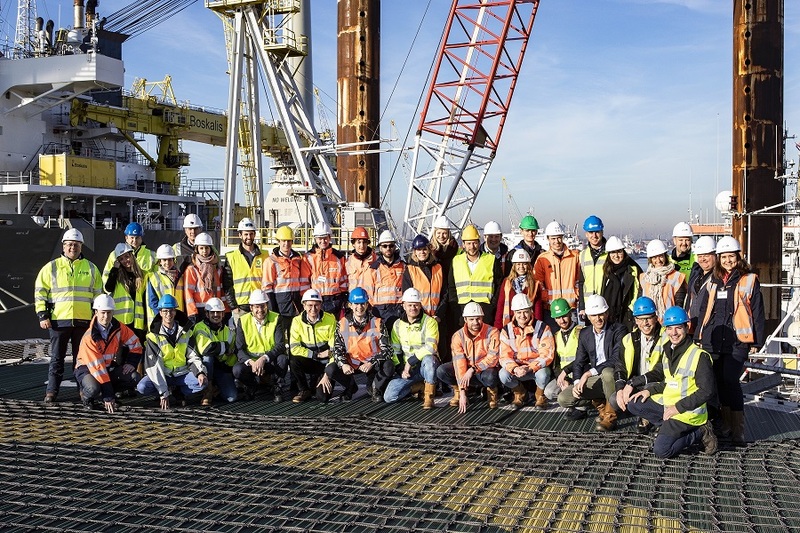 On Thursday, the Dutch offshore service provider Jack Up Barge welcomed 30 members of the industry platform Young IRO on the 55,5 meter platform JB-115 in Rotterdam for a peek behind-the-scenes. The JB-115 has recently completed a project on the Kriegers Flak wind park in the Danish part of the Baltic Sea and is on the verge of mobilizing to the German Bight for a project by Royal Van Oord. The Young Professionals that visited the platform were invited to experience the action and learn about the many different possibilities of working with jack-up vessels. The oil, gas and offshore renewable supply industry in the Netherlands is in the top five in the world. Half a century ago, the independent non-profit organization IRO was established to look after the interests of the 425 affiliated companies. Young professionals are very important for the IRO mission, especially in light of their contribution to a future-proof and sustainable industry. This is why Young IRO was initiated; a platform where the next generation of the industry comes together, accumulates new ideas and innovations and gets inspired. The initial idea for the JB-115 visit actually came from young IRO member, Dave Krabbenborg, manager production technology at Bayards. Dutch offshore service provider Jack Up Barge (JUB) owns and operates a fleet of five self-elevating jack-up vessels and two modular units. The fleet is among the youngest of the North Sea. In oil and gas projects, JUB seeks close collaborations with her 100% sister Swift Drilling. Around the world, in the sectors offshore renewables, offshore oil & gas and civil construction, JUB offers high quality and safe services.